Ryan wouldn’t just slash Medicare, Medicaid and Social Security. He would fundamentally alter how those programs work. Republican vice-presidential pick Paul Ryan is widely considered a leading conservative policy intellectual on welfare and entitlement spending. His budget—loosely adopted by the Republican Party platform—calls for a massive reduction in programs that benefit Americans broadly, and the poor specifically, in order to pay for big tax cuts. But his vision goes further, fundamentally altering the way the United States provides for the poor and elderly. Ryan’s plan takes the social insurance promises of the New Deal and the Great Society and turns them into something far riskier and less dependable. Ryan’s vision for reforming the social safety net can be explained in three verbs: he wants to block grant Medicaid, voucherize Medicare and privatize Social Security. Yes, Medicare, Medicaid and Social Security would likely still exist, but those changes would mean a profound difference for the average person who receives government benefits over his or her lifetime. Let’s look at what happens to Jessie, a low-income woman living in Pennsylvania who is eligible for all three programs at different periods of her life. Medicaid is a program designed to provide healthcare for people in poverty, an agreement between the federal government and states to jointly finance healthcare benefits. Since it involves cost sharing between federal and state governments, the federal government requires states to adhere to a defined level of benefits and eligibility baselines, which includes pregnant women and children. And lucky for Jessie, who also has diabetes, her chronic care will be covered while she’s on Medicaid. But Ryan’s budget would block grant Medicaid. In a block grant, the federal government gives states lumps of money and then turns over administration of the program to them. To see the effects of block granting in real time, take a look at the welfare reform of the 1990s that lead to TANF, a block grant of money to the states to help families living in poverty. As the Center on Budget and Policy Priorities reports, “over time, states [have] redirected a substantial portion of their TANF…funds to other purposes,” including plugging budget holes and freeing up money for other purposes. This meant that when the recession hit, many states couldn’t get that money back and ended up slashing benefit amounts or shrinking the number of people on the program just when it was most in need. In 2010, only twenty-seven of every hundred families living in poverty received TANF benefits. Block granting could also threaten Jessie’s eligibility throughout her life. Currently infants, children and pregnant women living in poverty are eligible for the program, while all states can and do go beyond those requirements to cover the working parents of children who are eligible. But only some states cover childless adults. Jessie’s home state of Pennsylvania doesn’t offer childless adults any benefits, and it only covers a small slice of working parents. That federal baseline of eligibility—for children and pregnant women—would now be up to states themselves, and Pennsylvania could decide to claw back eligibility just as it denies eligibility for childless adults. Other states could decide to keep expanded eligibility, assuming they can continue to find room in their budgets. Whether or not individuals can access benefits—and what those benefits are if they are able to get on the rolls—will largely depend on where they live. When Jessie hits retirement age, she will turn to the two other programs Ryan has proposed reforming. She has paid taxes into Medicare for her entire career, and at age 65, Jessie will sign up for the program in order to access health insurance. Medicare is a “defined benefit” program, which means it makes an open-ended commitment to providing medically necessary healthcare services for senior citizens. This system is taxpayer funded, with the elderly also paying through co-payments. It’s a universal government program that almost all senior citizens, including those who’ve earned more throughout their careers than Jessie, participate in. Ryan’s plan would voucherize Medicare, turning it into a program in which the government gives individuals coupons, or vouchers, that could be used to purchase healthcare. His first proposal dictated that the vouchers be used to buy insurance on the private market; the second allowed seniors to choose private plans or traditional Medicare. For Jessie, this means that instead of getting a defined level of healthcare, she will get a coupon for a set amount of money that she’ll have to use to purchase healthcare herself. Under Medicare, taxpayers absorb the cost when healthcare costs or premiums end up higher than expected; under the voucher program, Jessie has to make up the difference. For those who want to reduce government spending, the ability to put hard caps on spending is a big advantage. Once Medicare is voucherized, if the government promises to give Jessie a coupon worth, say, $5,000 for healthcare next year, then the most it will have to spend is $5,000. But where the government’s costs stop, Jessie’s costs rise. If premiums now cost $10,000, she has to find that extra $5,000 out of her own pocket. In that way, Ryan’s plan shifts risk almost entirely from the government to the individual. Remember George W. Bush’s 2005 plan to privatize Social Security? Paul Ryan was behind that. Privatization would have taken a program that came out of the New Deal—a form of social insurance—and partially replaced it with private investment vehicles. Ryan’s first proposal was incredibly ambitious: it would have given workers the ability to take half of their Social Security payroll taxes and divert them from the program into private investment accounts instead. After massive backlash—which prompted Bush to drop the proposal entirely, and contributed to the Democrats regaining control of the House and Senate the following year—Ryan proposed a pared-back bill that would only have allowed workers to divert an average of 6.4 percent of their payroll taxes to the plans. This plan is not in the current Path to Prosperity budget, but he’s not the only one on the ticket that’s come out in support of private accounts: in Mitt Romney’s 2010 book No Apology, he endorses partially privatizing Social Security by adding private accounts to it. Once Jessie hits age 67, she’ll start receiving Social Security benefits. In Ryan’s world, Jessie might at first think she stands to make more money on contributions to private investment accounts than the benefits she would otherwise get from Social Security. If the markets boom and stay strong for years to come, it’s possible she could—but the risk of a market downturn now falls completely on her. That's the difference is between an insurance plan and a savings account: in a savings account, “When the money’s gone, it’s gone,” says Virginia Reno, vice president for income security at the National Academy of Social Insurance. “If you want to ensure against risk, a savings account isn’t it.” Jessie, who has lived in poverty for most of her life, will face severe poverty if she outlives the money in her account. Much of the debate over Ryan’s budget has been on how much money he cuts. But this may not be the best way to understand what’s at stake in Ryan’s budget. Most scholars have historically looked at how much money is spent by a given government and assumed that countries that spent more money had both more generous and more democratic welfare states. But in 1990, the Danish sociologist Gøsta Esping-Andersen’s book The Three Worlds of Welfare Capitalism argued that researchers needed to look instead at how that money was spent. Esping-Andersen argued that there are welfare states that are social democratic, like Sweden, which provide a universal floor for basic welfare goods like healthcare and retirement security, independent of individual choices and investments. Those countries don’t treat access to basic welfare goods like commodities to buy and sell in a marketplace as individuals. Then are those that are “liberal” (in the European sense of the word, or more like “libertarian” in our political language), like the United States, where people’s income and wealth largely dictate whether they can count on a baseline of economic security and more of the money comes from private, versus public, sources. For example, adults outside of poverty get healthcare through their employers, who receive elaborate tax credits to provide this type of private welfare. The only exceptions are for the very poor, who are assumed to have failed in the market and thus need “means-tested” welfare programs. But not all of the United States’ welfare programs work this way, especially the key legacies of the New Deal and the Great Society. Ryan’s vision is to strip out the remaining social democratic elements of our mixed social insurance system and replace them with a completely libertarian vision. Even if the government spends the exact same amount of money, this is a radical change. In fact, the federal government could end up spending more money on these plans. As Ryan Lizza has written, Ryan’s original Social Security proposal “simply took money from one part of the budget and spent it on private accounts, at a cost of two trillion dollars in transition expenses.” Medicare, meanwhile, does a significantly better job of controlling costs than the private market because of its scale and size. As Peter Orszag writes in Bloomberg, Ryan’s plan “would increase the total [healthcare costs], because more cost-sharing for consumers doesn’t do that much to constrain spending and because private plans have higher administrative costs and less negotiating leverage than the federal Medicare program.” It can use that leverage to negotiate better prices, driving down costs. If we want to address ballooning healthcare costs, there are ways to do so without fundamentally changing Medicare’s structure. Obamacare uses the government’s size and leverage to reform the program, bending the healthcare cost curve and making it more affordable for all. And the more people are involved in risk-pooling, as under Medicaid and our Social Security system, the better the programs are at risk management. 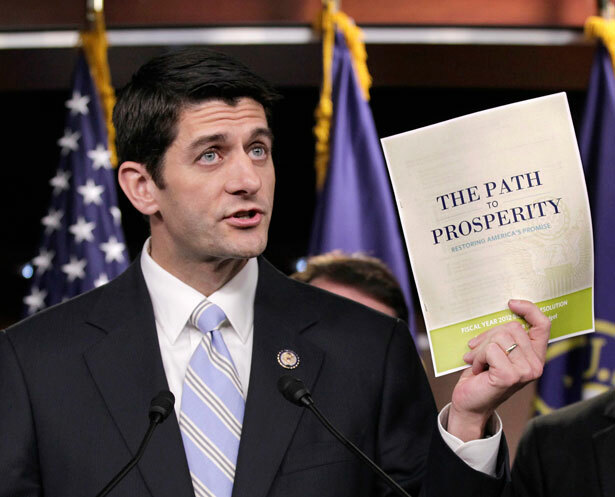 Ryan’s plan would complete, in the words of the political scientist Jacob Hacker, a great risk shift to the individual. An individual loses her guaranteed baseline of coverage for old age income and healthcare, becoming instead a consumer in a volatile marketplace. If she strikes out, she gets nothing. Americans have become so conditioned to the idea of market “choice” as a universal solvent, and government action as necessarily failing, that it is easy to forget government is the best provider of universal social insurance. Ryan’s reforms also replace the comfort of certainty with uncertainty and instability. If Medicaid is block granted, beneficiaries will no longer be sure of what baseline of care and coverage they can expect from state to state and year to year. If Medicare is voucherized, patients will no longer be able to depend on a basket of services but have to choose plans and coverage for themselves in a complex and opaque market. If Social Security is privatized, retirement benefits depend on how well the stock market performs—mostly a matter of chance. Where the federal government currently takes on the job of ensuring baselines of support, it would step back from that responsibility. In his 1944 State of the Union address, Franklin Roosevelt announced that “individual freedom cannot exist without economic security and independence.” Roosevelt’s call for economic security saw social insurance, provided universally by the government, as the logical end result. Ryan’s plan for a welfare state gives individuals a coupon and pushes them into a marketplace that is turbulent, risky and complex. His proposals don’t just represent drastic cuts in spending, which they certainly do. Perhaps more importantly, they unravel our entire system for guaranteeing Americans the right to a baseline of economic security.